It is often said that the process of learning has no end, since knowledge is infinite. Yet many tend to become complacent about knowledge and skills after acquiring a job. No wonder there is so much investment by successful corporate houses in training and development of their manpower to constantly assist and motivate their staff. After all, just like machines, men and their prowess too can become obsolete and outdated if not kept abreast with the times. This is where comprehensive e-learning methodologies come in. They help organisations ensure that their staff is on top of the skills they need as per market trends while saving on costs and time. In fact, so rapid has been the evolution of e-learning that companies are fast moving away from tools that merely reinforce the knowledge gained, basis which, training is assigned. Instead, they are quickly adopting technical and custom made e-learning facilities that act as a reinforcement of the learning and improve learning effectiveness, as well offer quick downtime. These courses on product training can serve as good refreshers to the sales experts. They can gain specific knowledge about the product, its specifications and uses. Its courses can act as support systems to learners. Post completion of classroom training in an institute set-up, online courses can act as job aids that help them in performing their tasks with more precision. Here’s a more concise look at six specific ways in which e-learning adds value to employee training, upskilling and management. Uploading the learning module on cloud servers ensures that it can be shared digitally with every member of the organisation. Regular updates, comments and feedback can be gathered, stored and disseminated on the spot. Employees can carry out the learning process simultaneously with the job, thereby not hampering the workflow. Cloud based learning platforms are also useful for employees who are on a leave yet want to remain abreast of the latest developments in the industry. With e-learning, it is easy to customize the modules according to the need of an individual. The learning process can be paced as well, and every member can compare her/his progress with the ideal time taken to understand a concept. Post classroom training, learners can still access online courses and specific job-aid videos to add more precision to their work. E-learning modules are highly effective with sales personnel. Online courses on product training can act as good refreshers to the personnel and help them describe the product better and in a more cohesive and detailed manner to the buyers. Updated information regarding the competitor’s strategies in a certain domain can be quickly communicated. A few e-learning providers have created their modules in a manner that allows personnel to recall the main pressure points regarding a particular product or process easily. At just a click of a button, crisp questions and engaging quizzes comprehensively summarize the module. Such learning alleviates the sense of confidence of an employee regarding the task at hand, and acts as a strong support system. Discussion forums on e-learning platforms are great spots for keen learners to compare their knowledge base, share opinions and views, discuss problems and have an overall healthy sense of competition. The presence of online leader boards and top performers bring in the jostle of a competitive, academic atmosphere. Combined with the urgency of being the excellent at your job, this feature brings out the best in any employee. The Shareable Content Object Reference Model ensures that the learner experiences content in a standardized way. It allows content creators to build highly engaging experiences, all-the-while capturing rich data about every interaction. Overall, an e-learning platform can create engaging content comprising videos, animation, graphics, etc that motivates the employees to keep learning about their trade for the development of a business. It also helps to act as an evaluation mechanism for the eventual process of promotion or appraisals and facilitates identification of potential executives, managers and directors in the organisation. Corporate e-learning has indeed emerged as a powerful tool for organisations to identify the prospective leaders who will steer the business towards greater prosperity. 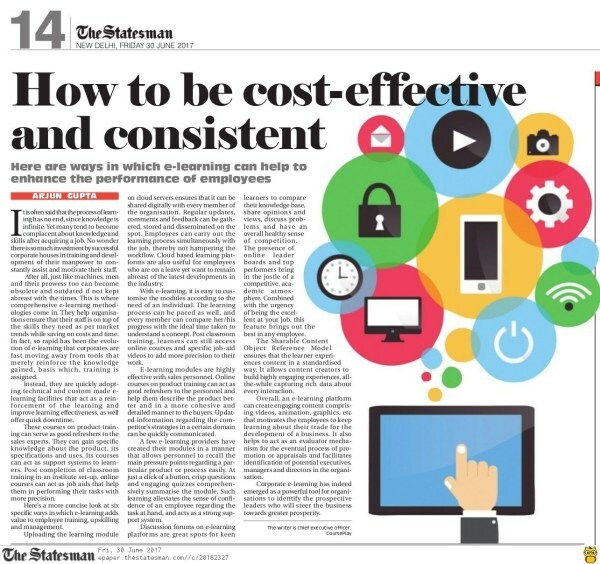 The original article was authored by Arjun Gupta and first published by The Statesman on June 30, 2017. Click here to read the article on their website.